The Lux is part of a stunning new 12 model electric bike range to suit all budgets. The Lux features a lightweight low step through aluminium frame with a suspension seat post and front suspension fork to smooth out the bumps and is equipped with a 7 speed shimano drivetrain, including rear derailleur and Revoshift shifter, braking is supplied via high quality alloy v brakes and promax brake levers. 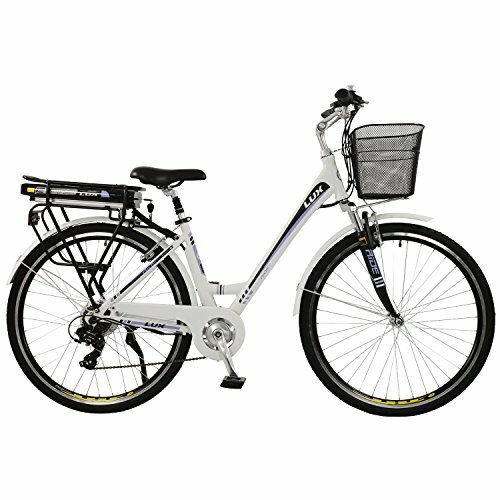 A high quality 250W motor is powered by a lightweight 36V/10.4AH Lithium ion Panasonic battery for reliability, and this gives a range of between 45 and 55km from on one charge. The Lux offers unsurpassed comfort with a well-padded saddle and suspension seat post, the handlebars feature a high quality Promax handlebar stem that is angle adjustable to suit any rider. - Supplied 90% assembled - minimal home assembly required before first use.